these socks are always a great buy, they last a long time and stay soft and comfortable for months of daily use. the no show socks have a lower cut then normal socks which is great for summer tennis shoes, and they come right to the ankle. they are super comfortable and have a slight stretch to them, that contains lycra spandex. they are mostly cotton, but contain polyester, and they are very soft to touch. they have an odor control, probably something to do with the material used in making it, but the package does not state how they are odor control. Made in the U.S.A. and the grey toe and heel parts are for added cushion when you walk, or stand. you get six pairs for size shoe six to twelve. my husband likes this type of sock better than any other style, he wears socks all the time, at the job all day where he is always on his feet, even at home. oddly enough, when we do buy more of these socks it's because they get a small hole in them, and that's after months of wear, but they always get holes in the same locations, either the grey of the toe or grey of the heel. but we'll see how long these last, over all these will always be my go to socks for they're durability and comfort. My husband loves his new socks he said they are extremely comfortable and well made. Normally his feet sweat a lot in certain socks and he did not have that issue at all with these he said. He also tends to get stinky feet from socks and these did not give him that problem either. They have great cushioning on the bottoms and are extremely comfortable for day to day wear or to go to the gym and work out in. He doesn't sweat in these so he does use them for the gym when he goes every other day with no issues at all. 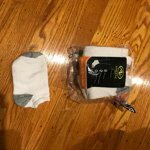 I received these socks to review and we liked them so much we have since purchased 2 more packages for him and my son for back to school. My husband loves clean new socks especially good quality ones. I think if you decide to purchase these socks you will be very pleased with them. 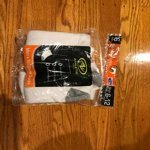 These are perfect for young adults as well especially for back to school socks as I purchased a pack for my teenage son who is in a lot of sports. I think these are great for athletes and people who work out and sweat a lot. I don't like wearing full length socks they're often too tight above the ankle. I don't really like going without socks my feet get too sweaty when they're bare inside a pair of shoes and they tend to slip around. I thought these would be a good choice. They're very comfortable and soft inside. The toe and heel have a slightly thicker fabric for more cushion that felt really nice. They especially felt really nice on my toes. I wore the same 2 pair for a week to test them out. I wore 1 pair in the daytime and 1 pair at night. I also wore them around the house without shoes, they felt very comfortable. I hand washed them every night, they held up their shape and didn't shrink. They came out of the wash bright and clean with no staining. They did a good job wicking moisture away from my feet. I've never had a problem with foot odor and I didn't notice anything with these either. I really like that they are anti-microbial giving me extra protection. These were labeled size 6 to 12, I'm a size 11 but I have very wide feet. They did fit and they stayed on but for me a larger size would be a better choice. If you have a regular width foot I think they would work out great even for a size 12. Even being stretched over my big feet they didn't bind or cut into my skin even around the ankle. After wearing them all day I didn't have any marks in my skin. They're very comfortable, almost like being barefoot. I have dry feet and calluses, I moisturize my feet heavily before bed these were a great choice for wearing to bed, they didn't slip off, they stayed in place and didn't get twisted. My feet felt great in the morning. Again after wearing them all night they washed up beautifully. In the future these will be my regular choice for socks. The Atlethic works Mens no show socks is very light wear like a glove, even for those who like myself have wide feet . I washed and dried and still fit the same way , no demage , no got loose or stretch, the socks stay the same way when i took it out of the package . I really recommend it . Love it ! Great Bargain- No Show Socks! The packaging is easy to open. There is an easy to pull away top. The top also contains a zip lock, which can allow you to reuse the bag for any future sock containing purposes. The packaging says it's good for odor control and it's made with spandex for better fit. Pretty decent pair of socks. Socks come in a six pack. This is good bang for your buck, definitely a value item more than anything else. I got this set since I haven't bought any new socks in years. I am a size 8.5 in sneaker and although these are men's sizes 6-12, it still fits me very comfortably. Although it says no show, the socks wrap just above my ankles and just a little with sneakers. I would wear this with my shorts and this is not bad. The colors are standard, white on the top and gray on the heel and front. Overall, this is a great buy and definitely a bargain. Nothing to blow you away but there's also not a lot of cons. I would only say that this could be a little thicker. Socks can also feel a little sweaty. I would buy this item again and also refer to my friends. I received these socks in exchange for my honest opinion. I so love no show socks. However, I like thin socks but these socks are extra thick and not to my liking. I don't like for my feet to sweat or feel suffocated. I wore them around the house due to them being so thick. I knew they would feel extra uncomfortable with tennis shoes so I did not even try them with tennis shoes. Needless to say, I do not think I made it a full hour with these socks. They are very durable though and they actually stayed on my feet unlike some no show socks. They are a little higher than normal no show socks also. I do not know if that is because they are men socks or what. I usually purchase thin women no show socks. This cover the entire top of your foot and the come right up to the ankle so I really think these should be considered as ankle socks and not no show socks. Now I would still recommend these to others because they are durable and others may like thick socks. I just prefer thin socks.They may also be great in the winter to keep your feet warm. Athlectic Works Men's No Show Socks! I was happy to have these socks offered in a recent Spark Reviewer program. My husband has worn these socks for several years and found them to be comfortable, well fitting and long lasting. By Athletic Works, these sock have odor control, lots of cushioning for comfort and also are part spandex for a great fit. They wash well and we didn't notice any shrinkage after drying. In the summertime, my husband often changes his socks two or three times a day so I like to have lots of extra pairs on hand. Very pleased and thankful for this extra six pack of no show socks. We'll probably be ordering more next year! These are a fine sock. They are a short, sport sock. They are cotton and white. A few things to keep in mind. If you're bigger than a size 9-10, these will likely not fit you. For a 6-12 range given, they are really not very stretchy. My roommate in a size 10 mens can't wear them, he says they are constricting. I wear a mens 8 and they are comfortable but even so I'll agree that the elastic at the opening is tight. They are fine for just walking around in daily shoes but I also found that the weave of the sock is somewhat.. hard? I know that sounds funny but they actually feel hard on the bottoms of my feet. Like, there is no cushion at all. May be great for a kid who burns through socks like crazy, or for lounging but I can't see myself purchasing them. Just not a quality feeling sock.